"Colored Rule in a Reconstructed (?) State", Harper's Weekly, March 14, 1874. 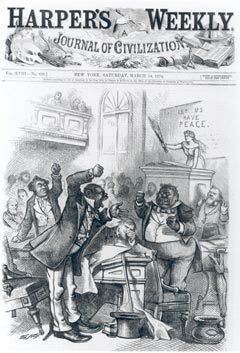 Thomas Nast, a long-time proponent of black rights, expressed his discouragement with Reconstruction by depicting members of the South Carolina legislature arguing amongst themselves. Nast's pessimistic caricature contrasted sharply with his earlier, more optimistic views.